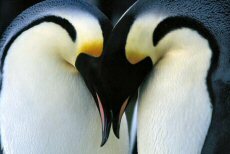 In the Antarctic, every March since the beginning of time, the quest for the Emperor Penguin begins to find the perfect mate and to start a family. The courtship begins with a long journey – a journey that will take them by foot about 78 miles across the icy continent, enduring freezing cold temperatures, facing brittle, icy winds until they ultimately reach their objective—another frozen tundra on a thicker sheet of ice. Having stored immense amounts of food on their bodies, they proceed to mix with each other until a final mate is chosen. They will then hunker down for the long, cold, dark winter, until the female lays its one egg for the year. Once the egg is laid, the female will hold it on her feet, covering it her feathers to keep it warm. Then, upon some mysterious signal, the female will pass the egg to the male who must quickly cover it with his fur to prevent it freezing into a block of ice. When the egg is safely tucked under the male’s body, the female, who has lost a lot of weight putting nutrients into the egg, is literally starving, and thus begins her long march back to the sea. 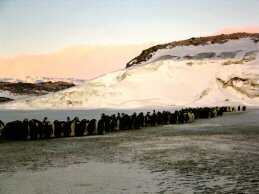 In the meantime, the males huddle together in a mass to keep warm braving fierce blizzards and temperatures reaching 80 degrees below zero, most of which is in the dark gloom of the harsh winter. Diligently and without food, they wait for the first light of spring to begin the hatching process. At last, the chicks begin to poke through the shells. Miraculously, at the same time, the females have returned from the sea to provide nourishment to the newborn chicks. The starving males now march to the sea to retrieve food that they will bring back for the growing chick. Finally, the parents abandon the chicks, which now make that same march to the sea to begin their lives in this continuing revolving door to perpetuate their species. Brilliantly directed by Luc Jacquet and narrated by Morgan Freeman, this magnificent film invites you to share a remarkable and magnificent journey through some of the most picturesque and harshest landscape on our planet. Jacquet’s patient filming over a year’s time, results in scenes never before seen in such splendid detail and beauty. The sharp contrast of Antarctica’s harsh climate against its awesome and spectacular scenery paints an image that will be deeply imprinted in all our minds. This is a film for all ages; however, very small children may become bored and cry.